Hyderabad: The Hyderabad Metro Rail opened for public today with the passengers describing their first-time travel by it as a “convenient, comfortable & awesome experience”. The metro rail commenced its operations between Miyapur & Nagole, having a total distance of 30 kms & 24 stations. Yesterday, PM Modi inaugurated the first phase of the 72-km elevated Hyderabad Metro Rail project at the Miyapur station. After launching the 30-km stretch between Miyapur and Nagole, Modi took a ride in the train on its inaugural run. [ 02.47 PM ] PM Modi, after inaugurating the metro rail would go to the Hyderabad International Convention Centre (HICC) for the opening of 8th edition of the three-day GES. [ 02.40 PM ] K Taraka Rama Rao, IT Minister had previously said 35 women loco pilots will be operating the Hyderabad Metro trains. [ 02.38 PM ] Metro Rail will be open to the public from tomorrow, 6 am to 10 pm. Initially, the trains would run from 6 am to 10 pm. It would be rescheduled to 5:30 am to 11 pm depending on the traffic & demand. A mobile app named ‘T Savari’ for metro passengers was launched by Modi who was also given a power-point presentation on the project at Miyapur station. 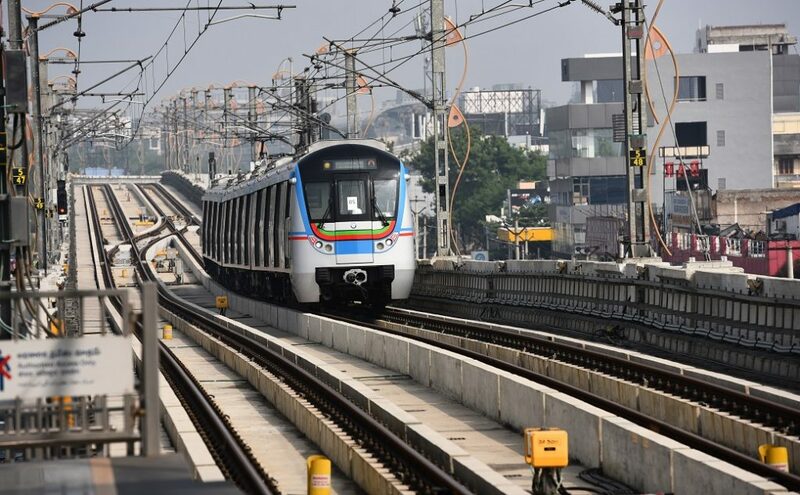 An official statement said, the Hyderabad Metro Rail project is the first ‘transit oriented development’ (TOD) project that will exploit the real estate and earn revenue by leasing out commercial and office spaces inside and outside the metro stations across the city. The rapid transit project has been planned with two components – stations along the elevated metro rail system & TOD branded ‘Hyderabad Next’. The statement said, depending on the city’s appetite, ‘Hyderabad Next’ will be developed with various assets like office & retail spaces, hospitality, healthcare, & mixed use facilities.